There's no doubt that India is a tempting place to shop! Each region in India tends to specialize in a particular handicraft industry that's been passed down over generations. The unique items that are produced all have their own individual appeal. Here's a state by state guide as to what to buy in India. Rajasthan, India's desert state, produces an eye-catching array of goods to delight the shopper. Textiles embroidered with colorful mirror work or block-printed are a Rajasthani specialty. Puppets are ubiquitous. To buy precious and semi-precious gemstones, head to Jaipur, Rajashtan's pink city. Blue glazed pottery is also made in Jaipur. Other items to shop for in Rajasthan include turbans, paintings, brass items, and traditional men's shoes that curl up at the toes. Gujarat's Kutch region is renowned for its handicrafts, produced by the very talented artisans in its villages. Bandhani tie die and ajrakh block printing are two famous arts that originated in Pakistan and were brought to Kutch by migrants more than 350 years ago. Embroidery, weaving, pottery, lacquer work, leather work, mud and mirror work, and rogan art (a type of painting on fabric) are also prevalent in the region. Odisha is known for its intricate silver jewelry, as well as tribal jewelry. Cuttack is the main hub for filigree work, or Tarkasi as it's locally called. The handiwork is among the best in the world. Buy it cheaply from the many silver emporiums next to Bhubaneshwar Railway Station (ask to see boxes of unusual silver toe rings kept behind the counters). 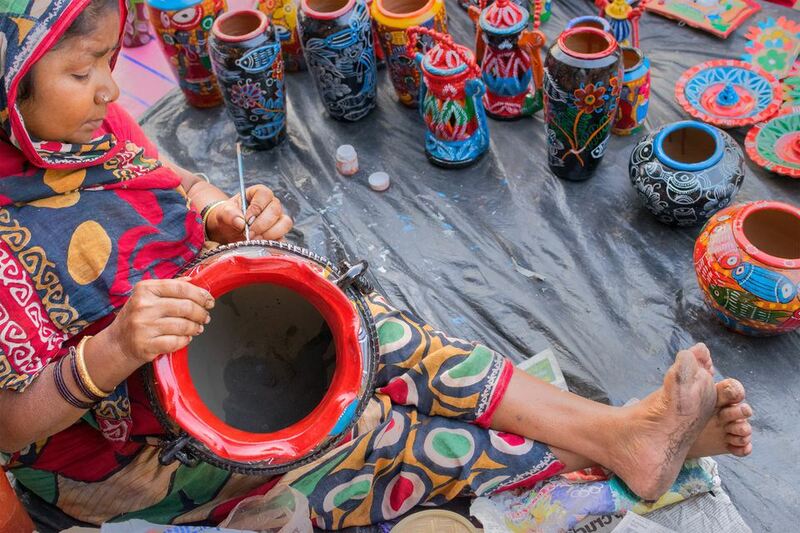 Also check out the diverse handicraft shops at Ekamra Haat urban market. Raghurajpur Handicraft Village near Puri is a great source of handicrafts including pattachitra paintings, stone carvings, wood carvings, and wooden toys. Pipli, located between Bhubaneshwar and Puri, is famous for its applique work. Kashmir is most renowned for its Pashmina shawls and carpets, with production techniques imported long ago from Persia. Other items originating from Kashmir include colorful papier-mache products, leather boots and shoes, and intricately carved wooden furniture including screens and tables. Head to the Boulevard in Srinagar to find shops and vendors selling a wide variety of items. The Kashmir Government Arts Emporium on Residency Road near the Tourist Reception Center is a popular fixed-price place. Don't expect to get a bargain there though! Silk saris from Kanchipuram (Kanjeevaram), near Chennai, are among the finest saris in India. You can save around 10% on the purchase price by shopping where they're made. However, as is to be expected, there are a lot of fakes out there. Sometimes, it's not easy to spot them either. The temple town of Tanjore (Thanjavur) is known for its intricate paintings with gold foil, usually of gods and goddesses. Marble items, obviously inspired by the Taj Mahal, abound in Agra. Some of them are made in exquisite detail, inlaid with semi-precious stones. For leather work, India's main production center is in the Kanpur area. Varanasi is a popular place to buy silk and saris, but it's important to check the quality and purity. Uttar Pradesh also produces a great range of copper and brass items. Karnataka is known for its fragrant sandalwood industry. Plenty of sandalwood carvings and incense can be found, especially around Mysore. On the road from Mysore to Bangalore, you'll pass the Channapatna toy village, famous for its bright wooden toys and rocking horses. Footwear is a good buy in Maharashtra. India's prevalent leather chappals (sandals) are made down south, around Kolhapur and Pune. Shoes can be found all through the markets of Mumbai, but particularly on Linking Road in Bandra. Mumbai also has a market called Chor Bazaar that's popular for antique and vintage items. Aurangabad is known for its patterned Himroo weaving industry, which produces shawls, sheets, bedspreads, and saris. Particularly stunning silk and gold thread saris are made in Paithan, near Aurangabad. The workmanship is carried out in painstaking detail, with price tags to match. The production of feni (traditional locally made alcohol) is booming in Goa. It comes in two types - cashew and coconut - and can be bought in decorative bottles to take home. Beware that it packs a punch! Goa is also renowned for its markets overflowing with colorful hippie clothes. The Wednesday flea market at Anjuna is the most famous but you'll find clothing stalls along the roads behind most beaches. Goa Beach Guide: Which Beach is Best for You? Kolkata specializes in the production of terracotta wares, including bowls, figurines, and wall hangings. Jute weaving is also popular in West Bengal, with products such as baskets, bags and dolls. Attend the annual West Bengal State Handicrafts Expo, held in Kolkata every winter, for an outstanding array of items. Being the cultural capital of India, Kolkata also offers a fine range of traditional Indian musical instruments. Further north, around Darjeeling and Kalimpong, is the territory of India's tea plantations. This is where to head for delicious, aromatic tea. A wide range of traditional woolen shawls and caps are produced in the Kullu Valley. These are very warm due to the cold winter climate so close to the Himalaya mountains. The influence of the Tibetan community can be widely felt in places such as McLeod Ganj and Dharamsala. Traditional Tibetan rugs, silver jewelry, prayer wheels and flags, meditation bowls and beads, and music are all readily available there. Bihar has a thriving wood carving industry, with wood inlay work being one of the state's oldest crafts. Bihar is also known for its unique folk art paintings. Many Madhubani ceremonial folk paintings are produced around the Patna area, by artists that have settled there. Chhattisgarh and Madhya Pradesh both have a significant tribal population, skilled in indigenous tribal arts. These include metal work (such as dhokra metal casting to make figurines) and paintings (such as Gond art). Maheshwar in Madhya Pradesh also has a hand-loom weaving industry, known for its Maheshwari saris. Wood carving is popular in Madhya Pradesh as well.